I’ve always been proud of the gallery’s commitment to doing our best for the artists we represent and show, whether they are painters, sculptors or ceramists. Our exhibition program primarily emphasizes major West Coast artists who have emerged since 1950, and presents ceramic sculpture in the context of the contemporary art world. In fact, 77% of our shows since 2004 have featured ceramics! Out of the eight shows we’ve held this year, six have included ceramics, for a total of 14 ceramists shown. I’ve always felt that exhibiting ceramic artwork in the company of other mediums is one of the best ways to overcome the traditional hierarchy of materials. At the Ferus Gallery during the 1960s, ceramic artists worked and showed alongside painters and sculptors – they were friends and peers. Continuing that tradition at Frank Lloyd Gallery supports my view that we don’t need to differentiate between ceramists and other artists. 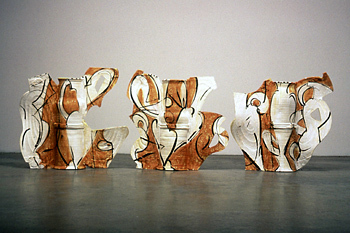 Showing ceramics to the exclusion of other materials only reinforces the conception of ceramic art as somehow “different” from other art forms. It’s my view that this obscures the ways in which ceramic art is a part of the the larger art historical conversation. Another point is that most of the so-called “clay artists” have always worked in other media. 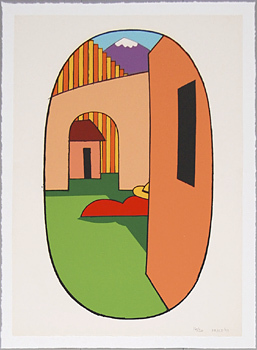 Take Ken Price, for instance. Our current show features some of his lithographs and silkscreen prints in addition to ceramic pieces, and he also produced watercolors and worked in bronze composites. 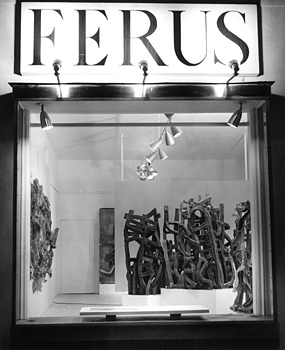 John Mason solo exhibition at Ferus Gallery in 1959. Kristine McKenna, a Los Angeles based author and curator, will sign copies of her latest book on November 21, 2009. The book signing event will take place at the Frank Lloyd Gallery, from 4:00 p.m. to 6:00 p.m. The recently published book, The Ferus Gallery: A Place to Begin, is an illustrated oral history of the Ferus Gallery, a storied enterprise that showcased modern art during the late 1950s and 1960s. Drawing from 62 new interviews and more than 300 photographs (most previously unpublished), the book retrieves a lost chapter of twentieth-century American art. The text is written and edited by Kristine McKenna. Kristine McKenna is a noted author, art expert and co-editor of the critically acclaimed publication Semina Culture. Kristine has also organized numerous exhibits about American music and art, and has written for the New York Times, Rolling Stone, the Los Angeles Times, Art in America, and many other major publications. In 1950s California, and especially in Los Angeles, there existed few venues for contemporary art. To a whole generation of California artists, this presented a freedom, since the absence of a context for their work meant that they could coin their own, and in uncommonly interesting ways. The careers of Ed Ruscha, Wallace Berman and Ed Kienholz all begin with this absence: Ruscha’s early and iconic Pop images combine words with images, Berman pioneered installation art with his first Ferus show, and in March 1957, Ed Kienholz, in collaboration with curator Walter Hopps, co-founded one of California’s greatest historical galleries, Ferus. Within months of opening, Ferus gallery gained notoriety when the Hollywood vice squad raided Berman’s first–and, in his lifetime, last–solo exhibition, following a complaint about “lewd material.” Shows by Kienholz and Jay DeFeo followed, but 1962 was Ferus’ annus mirabilis, with solo shows by Bruce Conner and Joseph Cornell, and solo shows of Roy Lichtenstein and Andy Warhol (his first gallery show ever). The following year, Ferus also hosted Ed Ruscha’s first solo exhibition. After Kienholz and Hopps moved on to other things–Hopps went on to mount the first American Duchamp retrospective at the Pasadena Art Musuem–the reins were handed to Irving Blum, who took over and ran the gallery until its closure in 1966. Former Ferus artists currently exhibiting at the Frank Lloyd Gallery are John Mason, Larry Bell, Ed Moses and Craig Kauffman.